From Captain Kirk in the original series, to Captain Picard in Star Trek: The Next Generation® and Captain Sisko of Star Trek: Deep Space Nine®, Star Trek has been the story of mankind stretched to the ultimate limits of strength, skill, and courage. Now a new captain has joined the ranks of the Star Trek heroes. 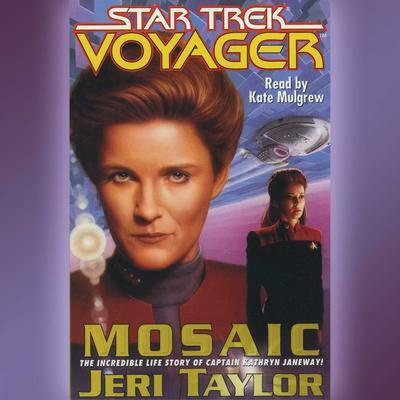 Mosaic tells the compelling life story of Captain Kathryn Janeway, commander of the Starship VoyagerTM. Mosaic finds Captain Janeway fighting a desperate battle on two fronts: while she duels the Kazon warship in the gaseous mists of a murky nebula, an Away Team led by Lt. Tuvok is trapped on the surface ofa wilderness planet. Forced to choose between the lives of the Away Team and the safety of her ship, Captain Janeway reviews the most important moments of her life, and the pivotal choices that made her the woman she is today. From her childhood to her time at Starfleet AcademyTM, from her first love to her first command, she must once again face the challenges and conflicts that have brought her to the point where she must now risk everything to put one more piece in the mosaic that is Kathryn Janeway.